Veganism is on the rise. Veganism is the consumption of all plant-based foods. That means no meat dairy, eggs, gelatin or even honey. Vegetarians generally will no meat, but will consume animal-based foods, such as dairy, eggs or honey. The meteoric rise of vegans in the United States (up 500 percent since 2014) has shifted the food landscape in this country, from offerings at supermarkets to what is listed on menus at restaurants and diners. Even meat processors have jumped into the plant-based game, with companies like Tyson foods in 2016 buying stakes in vegan protein company Beyond Meat, which makes vegan meat substitutes. The spike is largely attributed to health factors, specifically that cutting out meat and dairy from the diet can lower instances of heart disease, reduce blood pressure, promote overall wellness, and help with weight loss. But giving up meat also helps to conserve water, reduce carbon dioxide emissions, and prevents deforestation globally. But it makes it a whole lot more fun to give up meat (or to enjoy an occasional vegan or vegetarian meal) when the food is delicious. Vegans can now dine out without being limited to a house salad. Gone are the days of vegans banging their heads against walls after being reassured that there’s surely a salad on the menu. No matter where you live in the tri-county area, an increasing number of seasonal and year-round restaurants will cater to plant-based eaters without leaving you feeling hungry or unsatisfied. Thailand in Watertown offers tofu and mock duck dishes, while Bombay Duck Pickle Café in Carthage has a daily rotation of home-cooked meals that always includes vegetarian (if not vegan) options. It’s easy enough to eat vegan at any of the Japanese restaurants throughout the north country, and most Italian places have some pasta dish that’s vegetarian-friendly. But more and more, innovative chefs at premier restaurants throughout the north country are going the extra mile to thoughtfully include vegan meals that stand up on their own as go-to dishes, whether you’re a strict plant eater or can derive great pleasure from a well-prepared steak. Just ask the chef staff at The Chateau in Clayton, or the 1844 House in Potsdam. Stop in at the Dirty Gringo in Ogdensburg, or pay a visit to Bonnie Castle in Alexandria Bay. 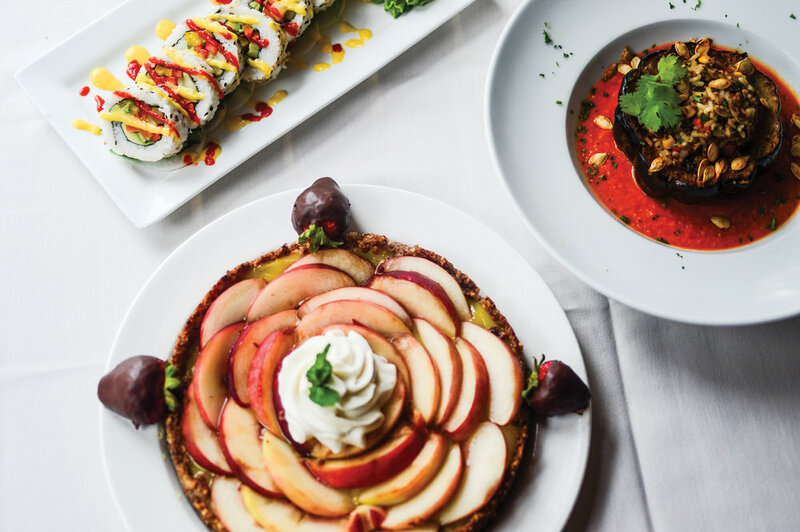 Whether you’re sitting outside in the summer at the Johnston House or dining indoors mid-winter at the 1000 Islands Harbor Hotel, chefs are making space for plant-based meals that are delicious, nutritious, and often include locally sourced produce. Vegan food has been totally underrated for far too long. “I’ve been cooking professionally since I was 16, but it wasn’t until I moved to New York City after college that I got to work in vegetarian restaurants in the Village and Lower Manhattan,” said Chris Polan, head chef at the Johnston House in Clayton. Polan gave up eating meat when he was a teenager. “I went completely vegan maybe about 20 years later,” he said. “Like most vegans I know, I had a hard time giving up cheese.” Now 56, Polan takes pride in serving up delicious vegan and vegetarian fare right alongside omnivorous dishes for the most discerning palates. At Johnston House, Polan’s vegan offerings are hardly paltry—or, for that matter, lacking in protein. “I’m lucky to be working for people who let me do my thing,” Polan said. “Our nightly Namaste feature was inspired by local authors Liz Price-Kellogg and Kristen Taylor. I love that it’s become so popular and I really enjoy trying things I wouldn’t normally get to do.” That ever rotating, vegan special leaves nothing to be desired—particularly meat. One night, it might be a vegan pad Thai with zucchini, carrots, snow peas, scallions, beansprouts, onions, peppers, garlic, ginger and tofu. Another night, you might get half hots stuffed with jasmine rice, red quinoa, corn, poblanos, lime, cilantro, and onion, sprinkled with nutritional yeast and served with spicy tomato oil. Local farming culture is a great resource for innovative, plant-based dishes. Originally from Huettwilen, Switzerland, Leibacher has worked at 1000 Islands Harbor Hotel since its opening in July of 2014. He’s found that local farms help to boost flavors in plant-based dishes while supporting local agriculture. Leibacher’s signature vegan entree on the Harbor Hotel restaurant’s dinner menu is an Asian-inspired dish with vegan rice noodles tossed with fresh vegetables, nuts, cilantro and mint with a sriracha broth. Leibacher’s inspiration for that dish is the same local source of inspiration Polan draws from at Johnston House. North country attitudes toward vegetarian fare are shifting.